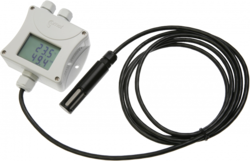 Sensor (probe) displays the output value as a continuous variable (° C, ° F, Ohms, V, mA,% RH, etc..). 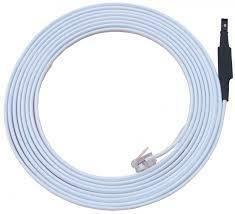 Our sensors are connected to the bus 1-Wire(UNI) - RJ11 or RS-485 (RJ45). Light intensity sensor for indoor use. Sensor for measuring and remote monitoring of 110/230V AC supply voltage. Its output is the voltage in [V]. 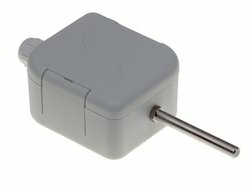 The Current sensor up to 30A AC. Based on split-core single-phase current transducer. It's indirect measurement sensor - you don't have to cut the wire. Voltage sensor for 0 to 60V DC. Electrically isolated, typically used to monitor battery voltage in telco applications (-48V standard). Current sensor for 0 to 20 mA DC current measurement. Can be used with the “source” type of the external probe. It's typically used with current transformers and other industrial probes. Current sensor for 4 to 20 mA DC current measurement. Provide power for the current loop. Can be used with the “sink” type of the external probe. It's typically used to connect output of the CO2 probe, tank level probe or other industrial probes.